John, I just thought I would give you an update on how things are going. I started the day after Memorial Day and worked the phone hot and heavy all week with not much success. I sent my packet out to about 5 or so shippers but I didn’t land a single load. On Monday the 4th, I got an email from a local company that was willing to give me a shot. They send out a group email to several brokers every couple of days with loads they need moved. I was able to book 4 loads this week and really gained their trust. On Friday (yesterday) their transportation manager was dealing with me only as I was cleaning up all the loads they had. I was able to get trucks for all but 1 of their loads and that was a bit upsetting. I had a load out of Kansas City that I could not get covered. I called 65 trucking companies and emailed a dozen more and could not get a truck. Kansas was a barren waste land for trucks! I was in constant contact with my contact though and he was very pleased with the work I had done for them. I am not making big money yet but made 10% or more on the 3 loads I was able to cover. That Kansas City load that I had to drop was going to pay me about 14% but it just didn’t work. All in all things are going well and the training you provided is really helping and the handouts are invaluable! Take care and I will check back with you in a few weeks to give you the progress report! Two years ago I have received training from John Thomas who owns ATex Freight Broker training out of Texas. Anyone interested in transportation brokering, this is your go to guy. People often ask me about this business. I can give you an overview of the industry, but I am not a trainer. Anyone who is seriously interested needs to contact John. This is the best training out there, where dollar for dollar you get your money’s worth. Thank you John for everything it was a pleasure working with you.. We learned a lot and I admire you for all your hard work and putting it easy for us! Thanks God bless! John, you did a wonderful job with the training material and you certainly helped me gain much knowledge over the telephone and our discussions in covering the various areas. And as promised, if I had any questions, or concerns you have been there for me to answer my questions and were quick in responding back. Thank You! John, Thank you for a Great job with the training material, you really helped me gain knowledge in covering the various areas of Brokering. As a Vet I want to say how glad I am we were able to complete this program. if I had any questions, or concerns you were there for me. God Bless you. From my perspective at this point the training was all that I wanted it to be. The only thing that I could have wanted to be different would be a sample script (example only) for conversations with both the shipper and the carrier to get set up initially. I had originally planned to take this course in a classroom setting. I am so glad I did not. The last thing John said to me was: We are always here for you to assist you and answer your questions. I like that a lot. I didn’t just receive the training and got thrown out entirely on my own. It is nice to know that I have a confident, solid support system for as long as I need it. I will most definitely recommend this program to anyone who is interested.. I would highly recommend Johns program to anyone, whether you have expertise in transportation or are new to the industry. His common sense approach, the one on one telephone training and his materials leave you fully prepared to succeed at what ever level you desire. The program was excellent… John the program is very well put together. 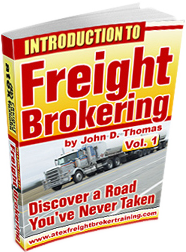 I recommend this course to others who have no experience in the trucking industry, as it is very complete. It will start them in the direction needed to succeed. Meeting an individuals schedule with one on one training was key for my lifestyle and this course did just that! Good job John the training was great. All handouts were helpful. I use your training manual every day. I have 3 or 4 shippers that I am currently trying to get set up with. I am just waiting on the paperwork. I enjoyed training with you and if I know of anyone that is interested I will send them to your website. Thank you. Just so you know I have already gotten a couple of orders from shippers and have sent out my packet to a few others…its only my second day!! I have not filled any of the open slots yet but cross your fingers for me. I’m pumped! By the way in my first full month of business I did 5 loads and this month I am projecting to do 12-15 loads…money, money, money!! Your pricing was excellent; you offered step-by-step procedures and on-the-job type documentation rather than a generalization of the freight broker business. And you were very helpful and honest with your answers. The training was excellent. I was unable to travel for training and this program offered me the flexibility of training at home at a time that was convenient for me. You were very patient and I really enjoyed training with you. I would like to commend you for your very inclusive compilation of your training manual. I found the material to be comprehensive, structured and very well organized. John, I want to commend you – thanks for everything and you do an excellent job with this class. My brother-in-law who is joining me in this business has a lot of positive comments too from reading your materials. The program was extremely valuable. I would most definitely recommend this training program to others. The Business Plan gets an “A”.